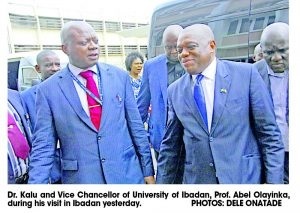 Former governor of Abia State, Dr. Orji Uzor Kalu, has established N100 million endowment chair in the University of Ibadan, to help brilliant students of the institution settle down to businesses of their choice; after graduation. Kalu made this known when he visited the Vice Chancellor, Prof Idowu Olayinka, in his office, as part of his Peace Advocacy Visit to the South West, which kicked off last weekend, in Lagos, which saw him and his entourage in Abeokuta, Ogun State on Tuesday. The former governor, who established the chair through his foundation, Orji Uzor Kalu Foundation (OUKF), explained that four best graduating students from the institution would be endowed with N250,000 each, beginning from the next convocation in November. He explained that the endowment was instituted to encourage young ones and empower them to start-up a livelihood after graduation, saying the beneficiaries would be drawn from the faculties of Social Sciences, Arts and Humanities. “This programme started five years ago and many students have benefitted from it. Executive Secretary of the foundation, Rev Jemaimah Kalu, in her address, said the mission of OUKF is to secure a brighter future for all, irrespective of age brackets, and added that the foundation has been putting smiles on the faces of the underprivileged in every part of the country. She reiterated that four best graduating students in the Department of Political Science, Economics and Faculty of Social Sciences, of the University of Nigeria Nsukka, have benefited from the kindness of the founder of OUKF. Mrs. Kalu also disclosed that the best students were endowed with N250,000 each and stated further that the OUKF has initiated a micro credit scheme for petty traders – Orji Uzor Kalu Foundation Interest Free Loan Scheme, and added that the scheme is in line with the United Nations 2030 poverty eradication and development goals agenda. She also disclosed that the foundation has also been paying school fees of indigent students, enlightening the public on political issues and health matters, taking care the elderly by giving them money and food, reaching out to women because of its belief in gender equality. In Abia North senatorial district, according to her, close to N60 million has been spent by the OUKF to empower scores of people, including petty traders since the beginning of this year, saying the gesture would also be extended to Oyo state and beyond. “This foundation has done same endowment at the University of Nigeria, Nsukka where four overall best students got N250,000 to start-up their lives. We are not limiting this to the institution, hence our letter to UI, Ahmadu Bello University, Zaria and Obafemi Awolowo University, Ile-Ife. Olayinka, however, said the institution would welcome collaboration with a view to encouraging students to be more studious, and urged other well-meaning Nigerians to emulate Kalu, who, he said, has empowered over 9,000 direct staff across the country. Meanwhile, the peace advocacy train of Kalu also stormed the palace of the Olubadan of Ibadanland, Oba Saliu Adetunji, at Popoyemoja, Ibadan, where he rallied support of the monarch and the traditional institution in Ibadanland, for President Muhammadu Buhari. Kalu said he was conferred with the title of Seriki Mayegun of Ibadanland, an honorary title bestowed on him by a former Olubadan, and that he was in the palace to encourage the Olubadan to continue to play his leadership role in the development of Nigeria. He enjoined the paramount ruler of Ibadanland and other traditional rulers in the 11 local government areas of the city to support Buhari, to complete his tenure, adding that Ibadan traditional institution should not abandon Buhari because he is a true democrat. Kalu, who noted that the ruling All Progressives Congress (APC) means well for the citizenry also said Ibadan has a strong history in Nigeria, since the days of the late premiers of the defunct Western Region of Nigeria, Chief Obafemi Awolowo and Chief Samuel Ladoke Akintola. He also advised the Olubadan to seek audience with Buhari if he has any contradiction he wants to clear; in terms of party or administration, adding that he could facilitate the meeting if the monarch could not seek the appointment directly. Oba Adetunji, who spoke through his Personal Assistant/Director of Media and Public Affairs, Mr. Adeola Oloko, said he has no personal animosity against president Buhari, and noted that the president has been part of Ibadan, since he passed through Ibadan when he was General Officer Commanding (GOC), 2 Division of the Nigeria Army, in Ibadan, alongside other military generals. The monarch also urged Kalu to extend his business interests to Ibadan, just as he commended him for the good work he has been doing in the country.